The University of Maryland (UMD) has appointed Amitabh Varshney, Ph.D., Interim Vice President for Research, effective October 3, 2016. In this role, Varshney will provide strategic leadership to support the continued growth of UMD's $560 million research enterprise. Varshney joined the UMD Department of Computer Science faculty in 2000, and since 2010, has served as director of the UMD Institute for Advanced Computer Studies (UMIACS). A leader in interactive visual computing research, Varshney’s work has focused on exploring the applications of high-performance computer graphics and visualization in science, engineering, and medicine. His research results are being used in climate modeling, plasma physics, nanomanufacturing, the design of buildings, cars, and submarines, medical imaging, gene sequencing, and the creative arts. He has engaged in research collaborations with a variety of partners in industry and government agencies. As part of the UMD-University of Maryland, Baltimore (UMB) strategic partnership, Varshney helped bring together scientists and clinicians from both institutions to establish a multi-disciplinary Center for Health-related Bioinformatics and Bio-Imaging (CHIB), tasked with solving grand challenges in personalized medicine and health care. 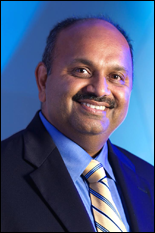 Varshney is an elected fellow of IEEE, a recipient of the IEEE Technical Achievement Award and a NSF CAREER Award. His B.Tech is from the Indian Institute of Technology, Delhi, and his Ph.D. from the University of North Carolina, Chapel Hill. Varshney succeeds Patrick O'Shea, Ph.D., the previous Vice President and Chief Research Officer of UMD, who was recently named the next president of University College Cork in Ireland. A national search for the permanent UMD Vice President for Research will be launched soon. Varshney will continue in his role as Interim Vice President for Research until the completion of the search.